Shruti Upadhaya is an aspiring author. She has written several poems and stories and some of the can be found on her blog thestorytellersparadise.wordpress.com. This is her debut novel. Very rarely do you come across a debut novel that claims to be a thriller and it actually does that... thrill you! Reading this book has been an adventure, extremely enjoyable and one that left me mixed feelings. This book has been rightfully called "Speed Reads". It is one book that is both a page turner and an edge of the seat thriller where a reader is compelled to finish it in one sitting. 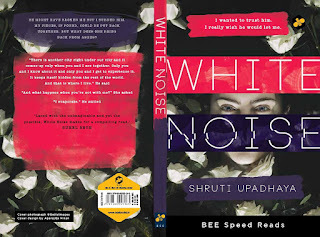 With strong characters and a plot that is like amoeba, one that surprises you with its changing shape, White Noise left me awestruck. Usually when it comes to debut novels, it is rare to see such finesse and poignancy in the writing. The language lucid and writing neat, making it a perfect companion on a lazy rainy day. With this mind-boggling novel to her claim the author Shruti Upadhaya has announced her arrival in the literary world with a bang. The writing is crisp, with no loose ends that demand an explanation or are left hanging out for the reader to keep wondering. A thriller like this definitely can be easily termed un-put-down-able. I will be honest in accepting I first said yes to the book only because I loved the cover, it was inviting so to speak. Then the blurb left me curious.With debut authors I usually read without much expectations but here I was pleasantly surprised when the book surpassed all my expectations. Towards the end, I swear I almost heard my heart thumping.in palpable excitement (Added to the fact that there was a power failure and winds were howling outside my window) as I inched towards the climax of the novel. Here I would like to mention, the climax is very well narrated. In thrillers, especially by Indian authors one of the common complaint I have is they tend to hurry up and hence take away the entire feel they built up during the novel. Here the author doesn't do anything like that. On the contrary she seems to make the climax seem like a natural progression to her story, not at all forced or rushed. Everything makes complete sense and leaves you feeling satisfied, at having read a wonderful book. Strongly recommended to all thriller lovers, she is one author to watch out for. 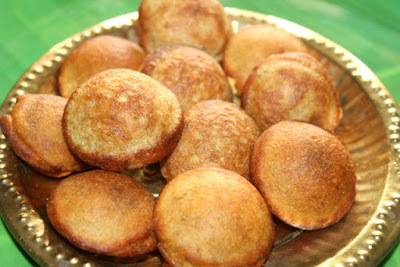 This book is like Sweet Rawa Appam - Crispy, sweet, crunchy and delectable!